I colored the Kitty in a Teacup image up with Copic markers, fussy cutting it out. 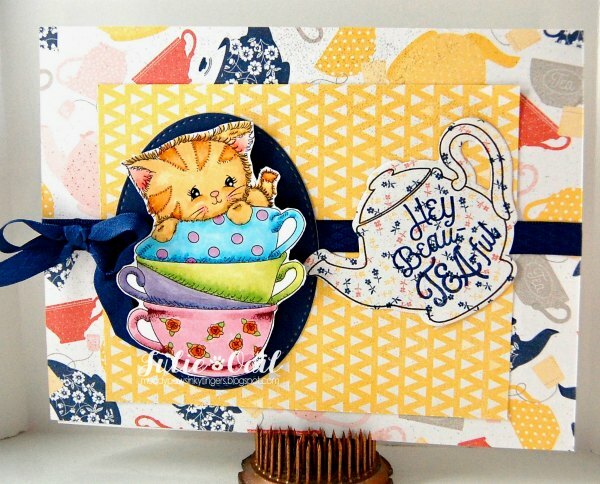 I found some teacup and tea pot papers, then a tea pot die and stamp, and my original idea of some sort of cat sentiment went by the wayside for this one (like I said, I'm not a cat lover). The papers, die, and sentiment stamp are from Close To My Heart. The ribbon is from Really Reasonable Ribbon. I had a great time letting my creativity flow with the song verse from this week at The Outlawz Sunday Songs & Rhymes challenge. I hope you join in the challenge. It's great fun to have a chance to guest design for them! Adorable card! Thanks for joining us for week #24 at Polkadoodles Crafting Challenge!